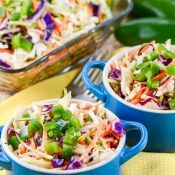 Cajun Honey Jalapeño Slaw is a light and refreshing vinegar-based cole slaw, with no mayonnaise, but sweetened with honey, and spiced with cajun seasoning, worcestershire, and hot sauce. Whisk first six ingredients in a bowl in a large bowl to make a vinaigrette. Add the cole slaw package to the vinaigrette. Add the minced jalapeño, and add salt and pepper to taste. Toss until combined. Refrigerate until ready to serve.